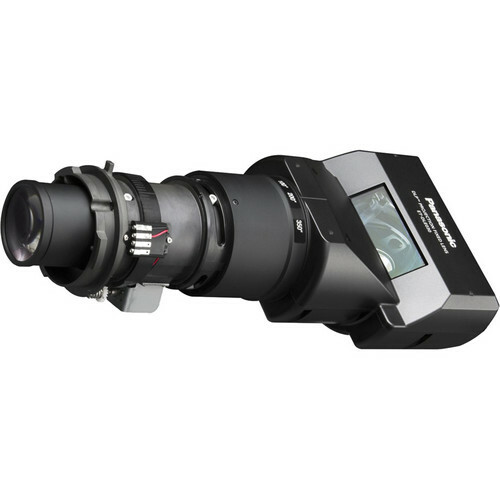 The Panasonic ET-DLE030 Ultra Short Throw Lens is designed for use with compatible Panasonic projectors. This lens allows you to shorten the projection distance, thus saving space and letting you project images in spots where you previously could not, such as places where the ceiling is too high, or where there is not enough front or rear space for projecting. It can be used for digital signage in show windows, stores, train stations, and other locations. Box Dimensions (LxWxH) 17.087 x 9.921 x 8.11"
Hi! Is this compatible with the Panasonic PT-DX100UK? If so, what would the throw distance need to be for a screen that is 16'x21'? The DX-100 is definitely compatible with it, and there are some others as well. BUT you must make sure you have the necessary height available to mount the projector ABOVE the screen. We were not told that by Panasonic when we called before making our purchase and now are in the process of trying to return 4 lenses we cannot use. Make sure to use the calculator on the Panasonic site for distances, etc. What is the projection distance when using the ET-DLE030lens and a 13'3 screen? The throw distance for a 13'3 screen with this lens will depend on which projector you are using it with. If you tell us which compatible projector you have, we can specify the throw distance.